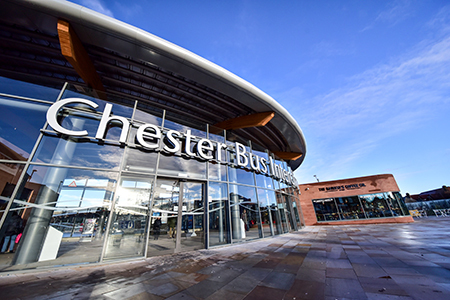 Chester’s Bus Interchange has won another award, as it picked up the prize for ‘Accessible Transport Project of the Year’ at the Smarter Travel Live awards in Liverpool. The Bus Interchange that opened last year has a range of inclusive design features including; directional and information signage, colour contrasting seating, bins and timetable displays, Shopmobility telephone information point, dual-height customer services counter with hearing loop system, an RNIB ‘Map for All’ (tactile map), unisex accessible toilets and baby changing facilities, Changing Places facility and tactile wayfinding paving for blind and visually impaired passengers. Councillor Brian Clarke, Cabinet Member for economic development and infrastructure, said: “Chester has already built a reputation for its accessibility. We work closely with local and regional disabled organisations, listening to their views and ensuring that they are involved in the design of major large scale projects including the bus interchange, Storyhouse, Frodsham Street and Chester Northgate. The Bus Interchange was a winner of the Medium Category at the North West Institute Structural Awards last year. Cheshire West and Chester Council’s frequent and accessible Park and Ride buses all use the Bus Interchange that also features a café and news agent. All buses have fold out ramp and designated wheelchair spaces and 170 accessible parking bays are available in Council car parks. The successful Shopmobility scheme sees 3,000 annual bookings, with Ability Angels available to support visitors to complete their shopping. 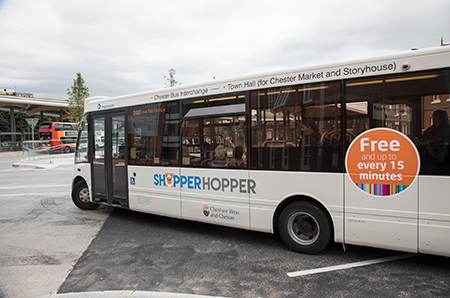 The shopper hopper bus also provides a link between the Bus Interchange and the city centre. The Bus Interchange operates 24 hours a day, staffed between 6.15am until 11pm Monday to Saturday and 6.15am until 9pm on Sunday. There are 13 bus stands supporting an average of 90 buses per hour (there are less services operating between 10pm and 6am). Information screens provide passengers with a live feed for bus arrivals. Chester became the first British city to win the European Commission’s Access City Award in 2017. This award recognises cities for their efforts to make it easier for disabled and older people to gain access to public areas, and highlights those who have clear plans for further improvements. Maps, interpretation panels, leaflets and online support website AccessAble also ensure visitors to the city know exactly where facilities can be found: disabledgo.com/organisations/cheshire-west-and-chester. Over 15 local and regional disability organisations are represented in the Council’s Corporate Disability Access Forum that provided input throughout the project.